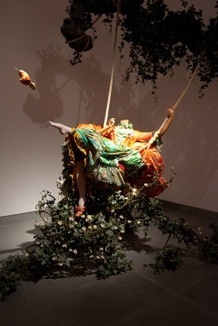 With her fingers delicately grasping the thickly coiled rope of a swing suspended mid-flight, a life-sized female mannequin flirtatiously kicks up her left foot, projecting her slipper into the air where it hovers above a tangle of branches. Our gaze is directed from the arch of her foot towards the vibrant trim of her petticoat, gown and coat. 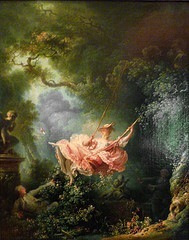 The Swing (After Fragonard) is a three-dimensional recreation of the Rococo painting after which it was titled, which itself offers testimony to the opulence and frivolity of pre-Revolutionary France. Painted in 1767, Jean-Honoré Fragonard’s The Swing depicts a coquettish young girl swinging in a lush and fertile forest and, of course, playfully kicking up her shoe. A sculpture of a bashful cherub looks on, but he is not alone; the female figure is flanked by two male figures lurking in the shadows, one seems to push her swing from behind, as the other mischievously glances up the layers of her dress to catch a glimpse of what is beneath. Shonibare’s quotations of eighteenth- and nineteenth-century style and sensibility are visually captivating; at the same time, tableaux such as The Swing contain some dark undertones. To begin with, the beautiful young protagonist of Fragonard’s painting has somehow become headless. This is likely a reference to the use of the guillotine during the Reign of Terror in the 1790s, when members of the French aristocracy were publicly beheaded. Drawing our attention to questions of excess, class and morality that were raised by revolutionaries two centuries ago, Shonibare invites us to also consider the increasing disparity between economic classes today, especially alongside the growing culture of paranoia, terror and xenophobia in global politics since 9/11. As a British-born Nigerian, raised between Lagos and London, Shonibare is especially perceptive to the ways in which issues of access, nationalism and belonging have their roots in modern European history, particularly with regards to the United Kingdom and its relationship to its former colonies. Here is where the specific fabrics that Shonibare utilizes become more relevant, as their symbolism is steeped in histories of cultural appropriation, imperialism and power. Though tailored in the fashion of eighteenth-century French aristocratic style, the costume that is modeled by Shonibare’s protagonist has been sewn from colorful and abstractly patterned fabrics with quite different origins: the bright golds, reds and blues arranged in geometric motifs across her ruffled skirt are typical of the “African” Dutch wax fabrics that Shonibare has famously used to adorn his figural tableaux throughout his career. While these fabrics have come to signify African identity today, the patterns on Dutch wax fabrics were originally based on motifs found in Indonesian batiks, and were manufactured in England and Holland in the nineteenth-century. Predictably, the European imitations did not prove lucrative when sold in South Asian markets, so Dutch manufacturers then marketed the textiles to their West African colonies, where they have since been appropriated and integrated into local visual culture. 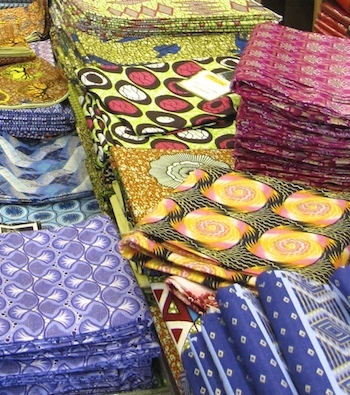 As fictional as their “African-ness” may appear to be, however, the fabrics have now been completely assimilated in places like Nigeria, where Shonibare grew up. As Enwezor points out, the material is “both fake and authentic, both readymade and original,” not to mention indisputably cosmopolitan. The question of what is “authentically” African has personal resonance for Shonibare, who, as an art student in London, was shocked when one of his instructors suggested that he make work that expressed his African identity. This conversation prompted him to think about stereotypes and the areas that exist between categories of identity and culture. The artist began using the material in 1992. What might Shonibare wish to communicate by bringing together these “African” textiles with Fragonard’s Rococo images, or any of the other European masterpieces that the artist has appropriated in his sculptural installations? In imaging this particular moment in European history, Shonibare wishes to forge connections between imperialism, the aristocracy, and the “colonized wealthy class.” In The Swing (After Fragonard), which is loaded with references to the French Revolution, the Age of Enlightenment and colonial expansion into Africa, Shonibare asks us to consider how a simple act of leisure can be so controversial. While the leisure pursuit might look frivolous (…) my depiction of it is a way of engaging in that power. It is actually an expression of something much more profoundly serious insofar as the accumulation of wealth and power that is personified in leisure was no doubt a product of exploiting people. In this and other works, Shonibare chooses stories—including biographies, world events, and works of art—which are already effective allegories concerning race, class, corruption and greed, calling our attention to some of the darker moments in Western history. However, his use of the Dutch Wax fabric, with its spurious origins and its misleading aesthetic identity, serve as a reminder that history and truth are also themselves constructions. Cite this page as: Dr. Allison Young, "Yinka Shonibare, The Swing (After Fragonard)," in Smarthistory, August 9, 2015, accessed April 21, 2019, https://smarthistory.org/yinka-shonibare-the-swing-after-fragonard/.